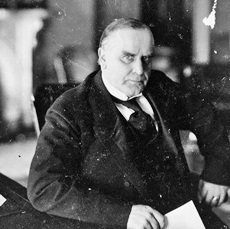 1898– President William McKinley asked Congress for a declaration of war against Spain. A February 15, 1898, an explosion aboard the USS Maine in Havana harbor killed 260 U.S. personnel. Public opinion in the U.S., driven in part by the misleading journalism of William Randolph Hearst, blamed Spain, though Spain had no reason for wanting to provoke the U.S. to intervene in Cuba’s war for independence. On March 26, McKinley demanded that Spain end hostilities by October 1. Spain rejected McKinley’s proposal and objected to his interference. McKinley requested authorization from Congress to intervene in Cuba on April 11. Two days later the U.S. Congress by vote of 311 to 6 in the House and 42 to 35 in the Senate passed the Joint Resolution for Cuban independence, which both disavowed any intention of annexing Cuba and authorized the President to use military force to end hostilities between Spain and Cuba. An ultimatum to leave Cuba or face American military intervention was forwarded to Spain on April 20. The Spanish interpreted this ultimatum as declaration of war, even though it technically was not, dismissed the U.S. ambassador, and declared war. On April 22, the U.S. fleet set sail from Key West, Florida, to establish a blockade and prevent the Spanish from delivering supplies to its military forces in Cuba. 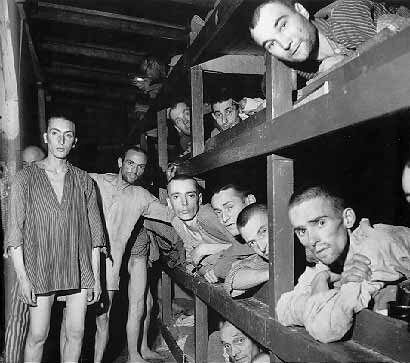 1945– A detachment of troops of the U.S. 9th Armored Infantry Battalion, from the 6th Armored Division, part of the U.S. Third Army, and under the command of Captain Frederic Keffer, arrived at Buchenwald concentration camp at 3:15 p.m. (now the permanent time of the clock at the entrance gate). Although the exact number of deaths at Buchenwald has never been (and will never be) determined, most estimates put it in the 55,000 range. Among the liberated were actor Robert Clary, known for his role as LeBeau on Hogan’s Heroes, and author Elie Wiesel, who would win the Nobel Peace Prize in 1986. 1951– In perhaps the most famous civilian-military confrontation in the history of the United States, President Harry S. Truman relieved General Douglas MacArthur of command of the U.S. forces in Korea. In December 1950, hundreds of thousands of Chinese troops had crossed into North Korea and drove the U.S. troops back into South Korea. MacArthur – a longtime proponent of invading North Korea, which Truman rejected – asked for permission to bomb communist China and use Nationalist Chinese forces from Taiwan against the People’s Republic of China. Truman flatly refused these requests and a very public argument began to develop between the two men. By April 1951, the military situation had stabilized, but when MacArthur approved an attack 20 miles north of the 38th Parallel, he did so without consulting with Washington until after the attack began. 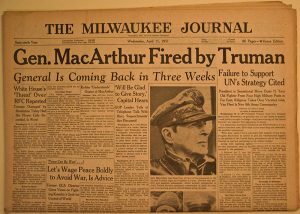 A furious President Harry Truman relieved MacArthur of his command. 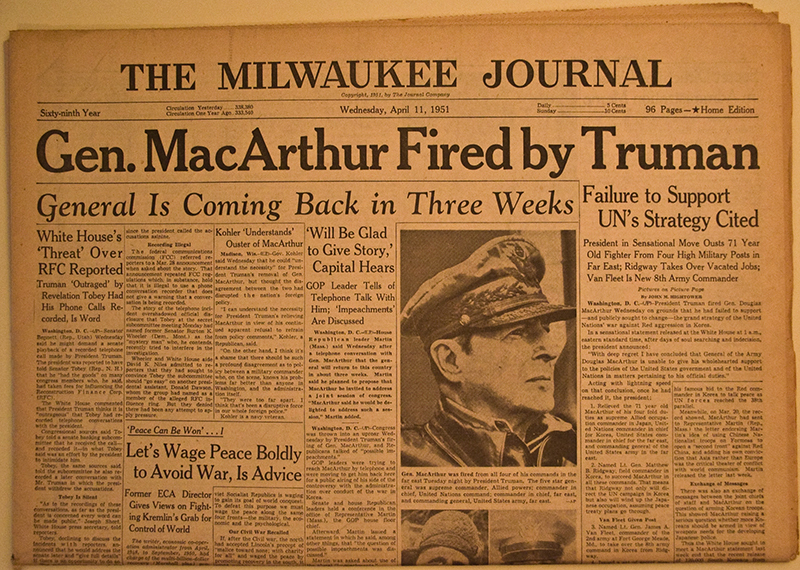 Truman’s dismissal of MacArthur came as a shock to many Americans. U.S. Sen. Robert Taft (R-Ohio) called for immediate impeachment proceedings against Truman. Following his dismissal, MacArthur returned to the United States to a hero’s welcome. Parades were held in his honor, and on April 15, 1951, MacArthur addressed a joint session of Congress. “I still remember the refrain of one of the most popular barrack ballads of that day which proclaimed most proudly that “old soldiers never die; they just fade away. “I could have won the war in Korea in a maximum of 10 days…. I would have dropped between 30 and 50 atomic bombs on his air bases and other depots strung across the neck of Manchuria…. It was my plan as our amphibious forces moved south to spread behind us – from the Sea of Japan to the Yellow Sea – a belt of radioactive cobalt. It could have been spread from wagons, carts, trucks and planes. For at least 60 years there could have been no land invasion of Korea from the north. The enemy could not have marched across that radiated belt. 1963– And so it began. One hundred U.S. troops of the Hawaiian-based 25th Infantry Division were ordered to temporary duty with military units in South Vietnam to serve as machine gunners aboard Army H-21 helicopters. 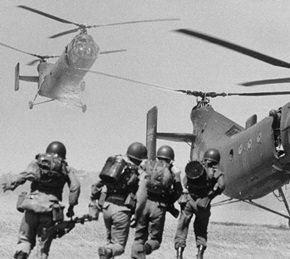 This action began a serious escalation of the U.S. commitment to the war in Vietnam. What had started as President Dwight Eisenhower’s “900 advisors” in 1955 would stand at 16,000 American military personnel in South Vietnam by the end of 1963. Six years later, there were 543,000 American soldiers in Vietnam. 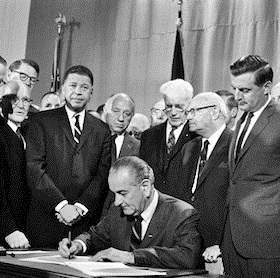 1968– President Lyndon Johnson signed the Civil Rights Act of 1968. 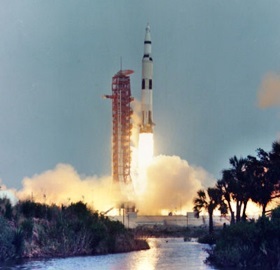 1970– Apollo 13 was launched from the Kennedy Space Center, Florida. It was the seventh manned mission in the Apollo space program and the third intended to land on the Moon. The lunar landing was aborted after an oxygen tank exploded two days later, crippling the service module upon which the command module had depended. 1979– Ugandan dictator Idi Amin fled from the Ugandan capital of Kampala as Tanzanian troops and forces of the Uganda National Liberation Front closed in. Two days later, Kampala fell and a coalition government of former exiles took power. His eight years of chaotic rule came six months after Amin had launched an unsuccessful attack on Tanzania in 1978 in an effort to divert attention from Uganda’s internal problems. He escaped to Libya, eventually settling in Saudi Arabia, where he died in August 2003. 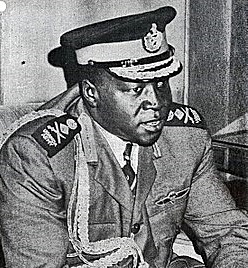 The deaths of 300,000 Ugandans are attributed to Amin. 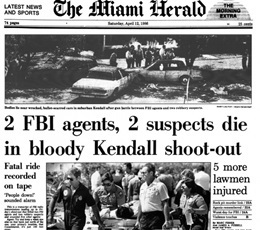 1986– The FBI Miami Shootout, a gun battle in a formerly unincorporated region of Miami-Dade County in South Florida (incorporated as Pinecrest in 1996) between eight FBI agents and two serial bank robbers was fought. The incident lasted under five minutes yet approximately 145 shots were exchanged. During the firefight, FBI Special Agents Jerry L. Dove and Benjamin P. Grogan were killed, while five other agents were wounded. The two robbery suspects, William Russell Matix and Michael Lee Platt, were also killed. The incident is infamous in FBI history and is well-studied in law enforcement circles. Despite outnumbering the suspects 4 to 1, the agents found themselves pinned down by suppressive rifle fire and unable to respond effectively. Although both Matix and Platt were hit multiple times during the shootout, Platt fought on and continued to wound and kill agents. This incident led to the introduction of more effective handguns in the FBI and many police departments around the United States. 1992– Actor James E. Brown died of lung cancer at the age of 72. 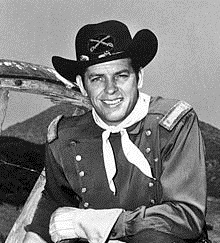 Although he had roles in more than 40 films, including Wake Island, Air Force, Going My Way, Sands of Iwo Jima, and A Star Is Born, he was best known for his role as Lieutenant Ripley “Rip” Masters in all 166 episodes of the television series, The Adventures of Rin Tin Tin. 2002– Congressman James Traficant (D-Ohio) was convicted of 10 felony counts including bribery, racketeering and tax evasion. Ten weeks later, the U.S. House voted to expel him by a 420–1 vote. 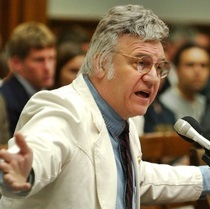 Traficant was, to put it mildly, not your typical congressman. He sported an unkempt hairstyle, which he jokingly claimed he cut with a weed whacker (it was revealed after his conviction that he wore a toupée). After he crossed party lines to vote for Republican Dennis Hastert for Speaker of the House in 2001, Democrats stripped him of his seniority and refused to give him any committee assignments. Because the Republicans did not assign him to any committees either, Traficant became the first member of the House of Representatives in over a century to lack a single committee assignment. Traficant was released from prison in 2009. He died in a tractor accident on his farm in 2014. 2017– Guitarist John Warren Geils, known professionally as J. Geils, died of natural causes at the age of 71. He was the founder of the J. Geils Band, who released eleven albums between 1970 and 1985 and had several major hits, including Freeze-Frame, Centerfold, Must Have Got Lost and Love Stinks. 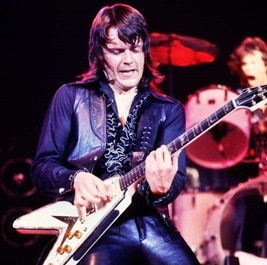 After the band broke up in 1985, Geils put down his guitar to concentrate on auto racing and restoration, but in 2012, he filed a lawsuit against the other band members when they allegedly planned to tour without him while using the band’s trademarked name.